The Opera is an Italian lively HiFi firm, always improving its products and designing new ones. So time was come to improve the nice towers named Opera Terza. I suggest to read the whole description and listening test of the first version of these floorstanders in the previous listening test. The improvements for this mkII version (though the name is still Opera Terza) are substantial: new tweeters and crossover network, while the woofers and the gorgeous mahogany cabinet remain the same. If you have read the previous version listening test you should be aware of the personality of these Italian floorstanders. 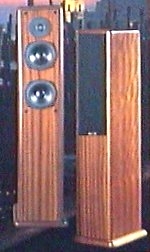 An outstanding bass range and warm mid-to-high range were the main pluses of these loudspeakers. The bass range was so good that one could have asked for a classier and more refined high range. And this is what the Opera engineers did, actually. The new tweeter is much more refined than the previous one, sweeter and classier, too. Now the difference (in quality, not in level) between the bass range and the high range is reduced, and the Opera Terzas have nothing to envy to sophisticated freestanders, because of the improved performance of the high range. The voices are more realistic though, only sometimes, a little bit *tamed*. This improves the overall enjoy of listening, never fatiguing even at loud levels. The bass range is exactly the same impressive one of the first version. The dynamic performance of the bass range is the same excellent I already described in the listening test of the first version, it is the behaviour of the high range that changes a lot. The new tweeters seem to need more power though the dynamic performance is better than the old ones: faster and with the ability to sound very loud without any compression. The 3D imaging is probably the parameter where the new tweeters and crossover do their best: the sound of the old version was sometimes too *in the face*, too *forward*. These new components create a 3D virtual scene mostly behind the speakers, increasing the size of the soundstage, especially the depth. Now the loudspeakers really disappear from your sight and you know how hard to reach is this result for tall floorstanders as the Terzas. The soundstage height remains almost the same. The focus of the image improves a little bit and the overall stereo illusion is far more realistic. A very nice and wide soundstage, like the one created by the best freestanders in the same price range. The new Opera Terza is an improved version of an already good-sounding product. Since you won't find anything written on the cabinet that tells you which version of the Terzaare you listening to, just take a look at the tweeter. The old one was bigger (26 mm) than the new one (20 mm) and also had a sponge-like baffle. Even the color is diiferent: dark grey the old one and balack the new one. So you can't go wrong with your choice. If you have already bought the old version, upgrading to the new one is possible though quite difficult: the new tweeter is smaller, so the hole in the cabinet is too large. You need some wood working skills to build a disc that fits in the old place, and where you can install the new tweeter. It is better to leave the work to a an expert technician, especially for installing the new crossover.